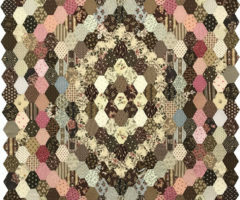 This hand pieced quilt, Little Sisters, is a smaller version of my “Circle of Sisters” quilt, which was inspired by a vintage quilt from my private collection. I have recreated this new version with modern techniques. Like it’s “bigger sister”, Little Sisters has been made using a purpose-made acrylic template set (included with the pattern). 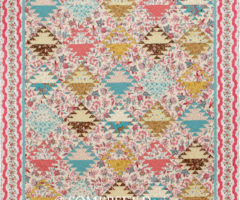 Henrietta was inspired by a combination of many traditional English Quilts. It has been created using a Medallion style layout, centred on an intricate design using appliquéd melon shapes. Machine or hand pieced, this quilt is lovely to make and is great for using your scraps. Measures approx. 58″ x 58″ (1.48m x 1.48m). This interesting twist on the traditional hexagon quilt has been created using our Honeycomb template (included with pattern). The quilt is best pieced by hand and is a fantastic way of using up leftover scraps, as well as larger pieces of fabric. Your use of fabrics and placement of colours can give your quilt quite a varied look from that show on our sample. Honeycomb measures as large as you want to make it. 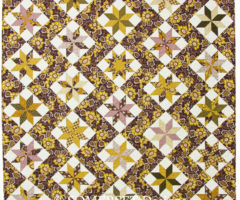 Our Vicksburg Revisited quilt features 4 large (30 inch) Star of Bethlehem blocks, with can be either hand or machine pieced. 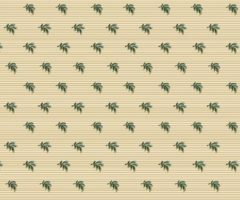 Easily constructed using the pattern’s printed template sheets, or you can use our Vicksburg template set. Measures approx. 72″ x 72″ (1.85m x 1.85m). 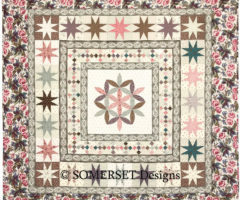 A remake of our “Roses” quilt pattern; this sample having been made using Karen’s “Bathwick” fabric line. Easily constructed using the pattern’s template sheets or our optional Briar Patch plastic templates. Quilt measures – Approx. 68” x 80” (1.73m x 2.03m) or larger to suit. 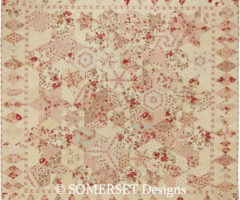 A remake of our “Cherry Ripe” quilt pattern; this sample having been made using Karen’s “Bathwick” fabric line. Quilt measures – Approx. 56” x 70” (1.42m x 1.78m) or larger to suit. This beautiful quilt, Mariner’s Compass, was inspired by a quilt from around 1810-20, in the Quilters’ Guild of the British Isles collection. The Mariner’s Compass has been made using a purpose-made acrylic template set (included with the pattern). The Mariner’s Compass quilt measures approx. 83″ x 91″ (2.11m x 2.31m). 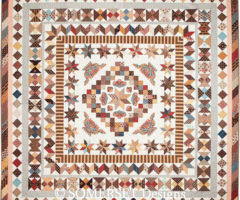 This hand pieced quilt, Circle of Sisters, was inspired by a vintage quilt from my private collection. Originally made in the 1940-50’s this quilt is bright and happy and full of fun fabrics. I have recreated this new version with modern techniques. Circle of Sisters has been made using a purpose-made acrylic template set (included with the pattern). 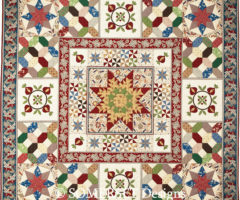 Victoria’s Garden was inspired by a variety of traditional English style Quilts. 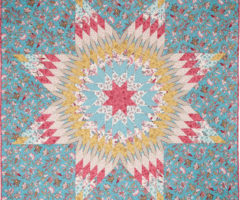 It has been created using a large Circular star, surrounded by appliquéd six pointed and pieced eight pointed stars with alternate solid squares of feature fabric. 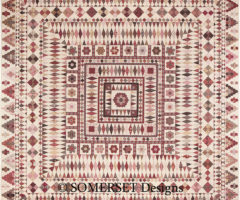 Inspired by a variety of English-style quilts, Okehampton features a medallion layout, centred on a large circular star surrounded by tiny hexagons. 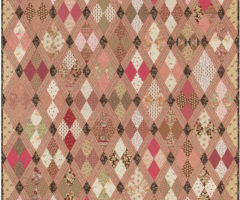 This quilt employs a variety of techniques to complete the appliques border of vines and hexagons, the clamshells and half-square triangles. 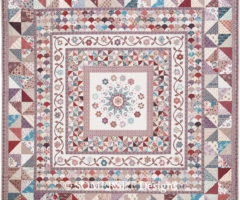 Avalon is based on a traditional style Sampler Quilt with an off centre Circular star, surrounded by an appliquéd border and five different hand or machine pieced blocks. These blocks are set in amongst an Irish Chain layout. Included in your pattern is a collection of templates, one for each of the pieced blocks and a pattern for the applique border. We are proud to present our “Mrs Billings Coverlet” as a single-purchase pattern, complete with acrylic plastic templates for every shape in the quilt. This beautiful heirloom quilt is a reproduction of the “Billings Coverlet” (c. 1790) in the collection of The Quilters’ Guild of the British Isles. Mrs Billings measures approx. 94″ x 94″ (2.40m x 2.40m) when finished. English Paper Piecing 5/8″ hexagon shapes are available separately. We recommend 2 packs of 560 papers for this project. “Robin’s Nest” is now available as a single-purchase pattern. This project comes complete with acrylic plastic templates for most shapes in the quilt. Measuring 70″ x 70″, this stunning design can be hand or machine pieced and features a small amount of hand applique. The “Hexagon Star a day” quilt is another wonderful project for hand-piecing enthusiasts; it uses a Hexagon Star Star Template set (included with the pattern) to ensure accuracy and consistency in both cutting and piecing the blocks. Hexagon Star-A-Day measures as large as you want to make it. 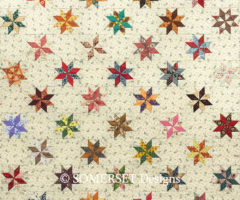 The “Star a day” quilt is a wonderful project for hand-piecing enthusiasts; it uses an acrylic 3” Lemoyne Star Template set (included with the pattern) to ensure accuracy and consistency in both cutting and piecing the blocks. 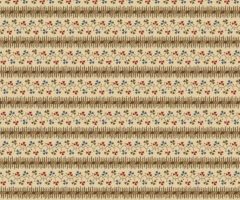 Have a look at our “Star-A-Day” fabrics packs – they’re ideal for introducing a wide variety of different fabrics to create a large assortment of individual stars. Star-A-Day measures as large as you want to make it. 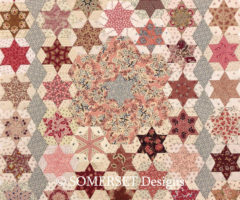 Canterbury is based on a traditional medallion style quilt, centred on an 8-pointed Lemoyne star surrounded by a number of pieced borders. 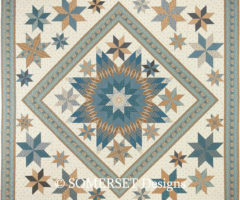 The pattern includes all the required printed template sheets but our optional 9-piece Lemoyne Star template set will make the cutting and piecing task so much easier, particularly if you are inclined to fussy-cut some of your fabrics. A scrappy quilt made from as many fabrics as you like. Quilt measures – Approx. 60” x 70” (1.5m x 1.8m) or larger to suit. 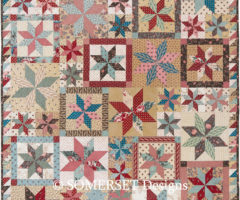 Created in the style of our popular Portsmouth and Somersby quilts, Hamilton Place features a central star pieced to great effect by fussy cutting a number of different fabrics whilst using only one small diamond template. 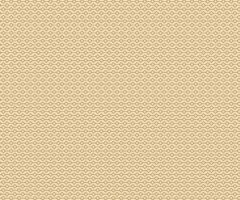 Pattern contains paper templates, or you can use our Lemoyne Star template set. Measures approx. 78″ x 78″ (2.0m x 2.0m). 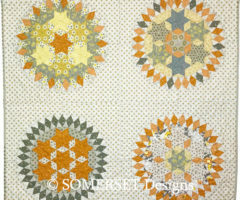 Explore the possibilities of our Hexagon Star template set to make this interesting sampler quilt. 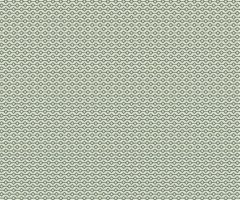 Use soft-blended fabrics or perhaps bright’n’bold for something different. Measures approx. 70” x 70” (1.8m x 1.8m). 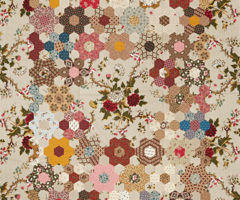 This traditional Grandmothers hexagon flower garden quilt features a large floral chintz central medallion, surrounded by a maze of hexagon rosettes. This quilt was originally featured in Quiltmania Ed. 100. Measures 43″ x 53″ (1.10m x 1.35m). 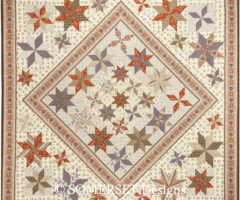 A beautiful quilt on which to practice your fussy-cutting, to create a visually spectacular star. Can be hand or machine pieced. 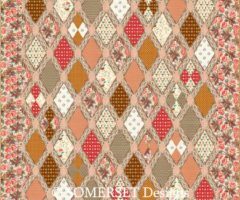 As with the Lady Victoria quilt, all fabrics in the sample are from Karen’s Victoria Park fabric collection. Measures approx. 67″ x 77″ (1.70m x 1.95m). 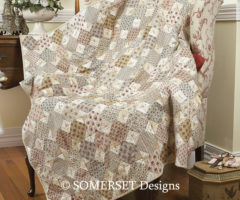 This quilt features Somerset Patchwork’s logo – the Lady of the Lake block – set against a beautiful floral background fabric. All fabrics in the sample are from Karen’s Victoria Park fabric collection. Measures approx. 66″ x 76″ (1.68m x 1.93m). 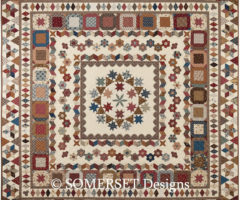 Merrimack is based on a traditional style Sampler Quilt with a large central pieced star, five different pieced blocks and two appliqué blocks. Price includes our “Merrimack” purpose-made set of acrylic plastic templates. The antique snowball block is a simple, traditional block great for beginners. This quilt can be made from as many fabrics as you like – it’s a great stash buster! For something different, instead of hand or machine quilting, our sample has been tied at each of the block corners for a softer look. 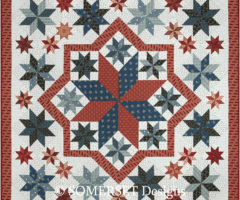 This quilt features an intriguing layout of the same star in 4 different sizes, with the large central star further highlighted by a contrasting border. 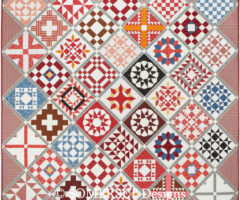 Creates a visually stunning quilt to hang or use around the home. 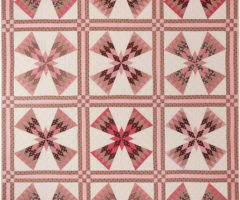 Working with the traditional “Jacob’s Ladder” block and using the fabrics in a positive/negative colour scheme, this cleverly designed quilt is a visual delight. Whilst designed with reproduction fabrics in mind, this quilt would look just as striking in contemporary prints and colours. 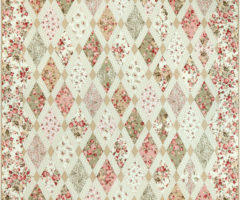 A collection of lovely Rose fabrics, diamond set with a border to make a lovely queen-size quilt. Constructed using our Briar Patch templates. Quilt measures approx. 70” x 82” (1.75m x 2.1m). 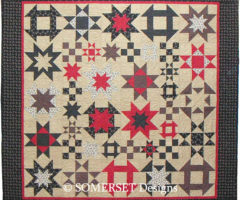 A simple yet striking quilt utilising Lemoyne Stars set in the diamond. The zig-zag layout lends itself to an effective use of large floral prints. Pattern includes paper templates or you can use our 10″ and 5″ Lemoyne Star templates. Measures approx. 70” x 77” (1.78m x 1.95m). A cosy queen-size quilt featuring stars and basic blocks. Pattern includes easy rotary cutting and machine piecing instructions. 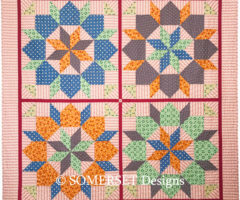 Lots of 8-pointed stars of 3 different sizes, set in a medallion-style quilt. A great way to use a favourite border fabric. 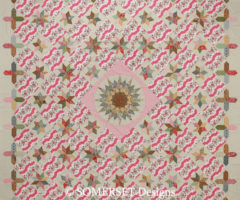 Pattern contains paper templates, or can use our Lemoyne Star template set. Quilt measures approx. 78” x 78” (2m x 2m). 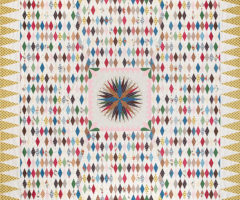 This is our modern interpretation of a wonderful antique quilt originally made around 1840 for Thomas Sykes, a Quaker from Ohio. 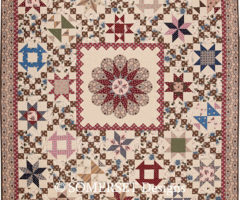 Featuring forty-one 10 inch blocks all set on point with varying degrees of difficulty, this quilt is a beautiful hand-piecing project although some blocks are suitable for machine piecing. A terrific family heirloom quilt. Pattern contains paper templates and comprehensive instructions. Measures approx. 81″ x 81″ (2.05m x 2.05m). 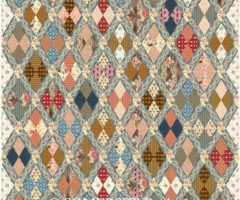 The Bows Quilt is a loving reproduction of a quilt originally made circa 1860. 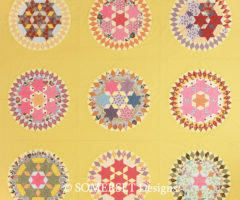 The layout is unusual as most quilts similar to this are set square rather than on point. In its original layout, the common name for this block is Indian Teepee. This quilt can be hand or machine pieced. Quilt measures approx. 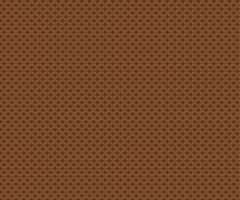 72” x 95” (1.8m x 2.4m). Finished with a saw-tooth border, this scrappy quilt features 3 different sized Lemoyne Stars pieced so as to give a random appearance. 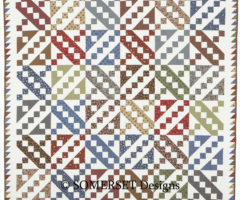 Whilst named after the fabric range the sample is made from, this quilt could easily be made in any colourway from your own fabric stash.